Our Key 2 Life ® EMR Medi-Chip stainless steel heart USB key chain can be engraved with up to 4 lines of custom engraving! 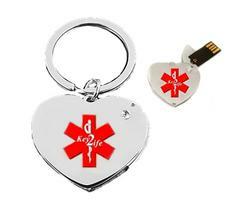 USB Medi-Chip Portable EMR (Electronic Medical Records) Stainless Steel heart Key Chain. Lightweight and easy to carry. The USB slides out from within the heart. In an emergency or a disaster, having your medical records instantly to EMT's, physicians and rescue personnel could save your life or your loved ones life.